Help! My horse is strong — what should I do? 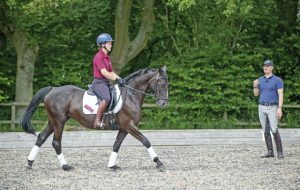 The time between leaving the dressage warm up and entering the arena shouldn’t be wasted. Four-star event rider Georgie Strang has some helpful advice on how to impress the judges before they start marking you. How do I see a stride? My horse won't load — what should I do? How can I improve my horse’s straightness? How can I stop my horse rearing?